From downtown Lodi, take Highway 113 North to Ryan Road. Turn right onto Ryan Road and then left to stay on Ryan Road. The church is on your right. 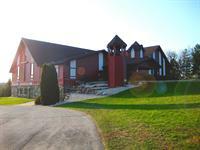 Lake Wisconsin Church is an Evangelical Free Church established in Lodi in 1971. Our services times are Sunday mornings at 8:30 am (Traditional Service) and 10:00 am (Contemporary Service). Childcare is provided during our Contemporary worship service for children through middle school. During the school year, we offer Awana and middle school and high school youth groups during the week as well as small groups and adult ministries throughout the week and throughout the community. Please refer to our website for more information on all we offer.